First and foremost, you should not use human shampoo or conditioners on your dog. These are formulated for human skin which has a different pH balance to a dog’s. Using products designed for humans on your dog can disrupt this balance and create an environment where bacterias and parasites can develop. As is the case with dog foods, there are many types of dog shampoos on the market. So, how do you know which ones are best, and, more importantly, safe? Well, usually opting for a product that is advertised as natural or organic is your best bet. These are unlikely to contain nasty chemicals or preservatives which can be damaging to your dog’s health. You should avoid shampoos that contain synthetic fragrances or perfumes, as these can irritate your dog’s skin, causing skin disorders such as dermatitis. Shampoos that contain organic essential oils, which are derived from natural sources, are a much better choice for your dog. Dyes or colors can also irritate your dog. A dye called Tartrazine, for example, has been found to cause allergic reactions and even tumors. Instead of brightly colored shampoos, opt for chemical-free shampoos that have paler, more natural colors. Parabens are used as a cheap preservative in some dog shampoos. These can be damaging to health; they have been linked to breast cancer in humans. Choose shampoos that use natural antioxidants or citrus seed extracts, such as grapefruit seed extract, as a means of preservative. These detergents are often used in shampoos to create a foaming effect. They can cause irritation to the eyes and the skin, and should certainly be avoided if your dog’s skin is sensitive. Instead, search for products made with natural fatty oils like coconut oil or olive oil. This is an anti-static agent derived from a fatty acid found in plants and animals. In high concentrations, it can cause irritation to your dog’s skin and eyes. These are a group of chemicals made from amino acids and alcohol that are used to create a creamy, foamy texture. However, when used in the same product as certain preservatives or other ingredients, they can break down and form nitrosamines. These chemicals, some of which can be absorbed through the skin, may be toxic and can cause cancer. While it may sound harmless, mineral oil is actually a by-product of petroleum. It coats the skin and stops it from being able to release its own natural oils or eliminate toxins. It has also been found to to cause health problems like kidney and liver damage. Nasty stuff – avoid, avoid! So what are some safe shampoos for dogs? I hear you ask. Well, now we know what we’re not looking for, we can move onto looking at some products that adhere to these strict no-nos and include all the right ingredients to keep your dog’s skin and coat clean and healthy. Earthbath pet shampoos are developed and manufactured in California using only natural ingredients. Their all-natural shampoos come in a wide range, from hypoallergenic to special 2-in-1 conditioning shampoos. This shampoo is formulated especially for dogs with sensitive skin. The use of oatmeal and aloe vera combat irritation and moisturize dry skin. Many reviewers comment that it has alleviated their dog’s dry skin and left their fur feeling clean and soft. Earthbath assure that this product won’t wash out flea or tick products. There is nothing artificial or synthetic in 4-Legger’s products. They are all USDA Certified Organic to Food Standards, and they produce their products in small batches to ensure the highest quality. This product from 4-Legger is suitable for dogs of all skin types. 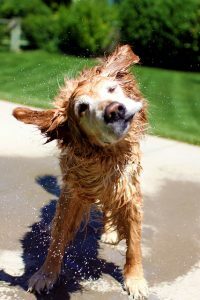 For dogs with dry, itchy skin, it can provide great relief, as the use of natural oils will not strip your dog’s coat of its… well, natural oils! What’s more, lemongrass is a natural cleanser with antibacterial, anti-fungal, and toning properties. Many customers have commented that this product has relieved their dog’s itchy skin and that their dog stayed smelling great for a long time after. This no-rinse shampoo from Wahl is a great option if you want to give your dog a quick clean between baths. It’s also good for dogs that hide as soon as you mention bath time or for those who are older and have trouble getting in and out of the tub. Wahl products are 100% natural, and this particular shampoo uses a calming formula made from lavender and chamomile, which cleans, conditions, detangles, and moisturizes. Just spray, work into your dog’s fur, and towel dry. 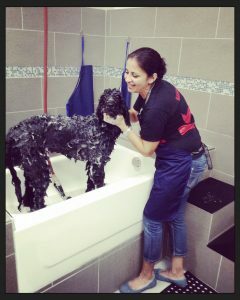 Customers comment that it leaves their dog smelling fresh and looking clean, just as if they had washed with water. This pet shampoo from TropiClean is medicated to soothe sensitive skin. It is suitable for both cats and dogs, and they also add that it is safe for their humans! Tea tree and natural salicylic acid help reduce scaly skin and dandruff and moisturizes your dog’s coat to make it snuggle-worthy. What’s more, this product wins major environmentally-friendly points, as it is made from 50% recycled material and the packaging is 100% biodegradable. Plus, TropiClean use 70% organic ingredients. It is also soap-free, so it won’t wash out any spot-on flea products. Several customers have rated it highly for dogs with flaky skin, saying it leaves their dog’s skin soothed and coat moisturized. Burts Bees brings you a 2 in 1 shampoo especially for puppies, which cleans and conditions your pup at the same time. This will get bathtime over with quicker – let’s face it, we all know how over excited puppies can get, so this will seriously reduce mess and stress at bathtime! The use of buttermilk in this shampoo helps to soothe and soften skin, while Linseed Oil conditions both the skin and coat. As this shampoo doesn’t include sulfates, which are foaming agents, customers report that it is indeed “tearless,” as it doesn’t seem to irritate dogs’ eyes. However, some customers say that it is not very spreadable for this reason. Burts Bees claim that this product does not wash off topical flea or tick treatment. When choosing a shampoo for your dog, make sure you read what it contains carefully to check for any nasty and potentially harmful ingredients. 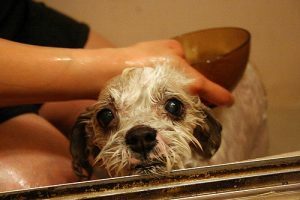 There are plenty of all-natural dog shampoos out there which you can use to clean your dog the safe and healthy way.